This souvenir guide, created for Historic Royal Palaces, was printed in six European languages, as well as Japanese and, of course, the Queen’s English. Despite being constrained by time and space, photographer David Chalmers captured all the pieces in this historic collection in their full pomp and glory shortly before they were moved to the new Jewel House in the Tower of London. The result was a sumptuous 52-page booklet that sold significantly more copies than its predecessor, despite the cover price being increased several times. 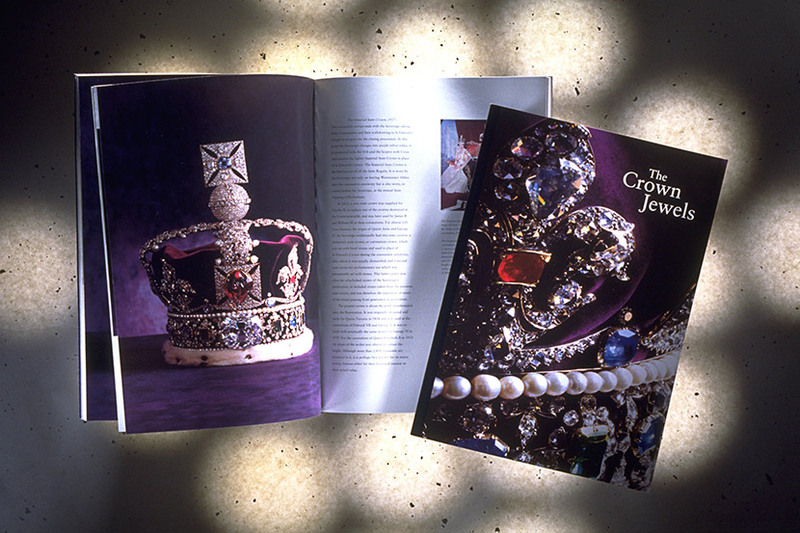 In order to produce the guide, David Hughes and fellow designer Piers Rutterford worked with David Chalmers and the Crown Jeweller, David Thomas, for 21 nights down in the vaults of the Tower of London. Working a night-shift meant the shooting schedule didn’t disrupt the normal day-time operations of this major tourist attraction.